About 1,000 to 1,200 years ago, a Viking man still in his 20s was laid to rest on a craggy island in the Norwegian Sea. A new analysis of his skeleton and others buried nearby — several without their heads — suggests a haunting possibility: Some of the dead may have been slaves killed to lie in the grave with their masters. Slavery was widespread in the Viking world, and scientists have found other Viking graves that include the remains of slaves sacrificed as "grave goods" and buried with their masters, a custom also practiced in ancient China and elsewhere. 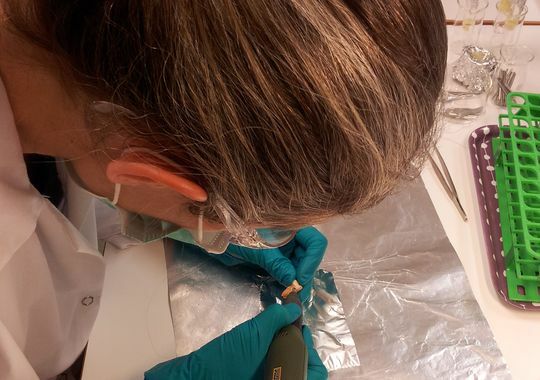 But the newly analyzed site is one of a very few Viking burials to include more than one slave, says the University of Oslo's Elise Naumann, a Ph.D. student in archaeology who led the research. "These are people who had values very different from our own," says Naumann, whose study was published online in the Journal of Archaeological Science last week. "There were probably a very few people who were the most privileged, and many people who suffered." The skeletons were found in the 1980s by a farmer working the fields. Documentation of the discovery is sparse, and the excavations did not involve archaeologists. But from the start, the researchers suspected they were onto something unusual. At least three of the seven skeletons divided among three graves were apparently buried without their skulls — a mark of disrespect seen at other slave burial sites. The scientists believe that every intact body was probably buried with one or perhaps two headless bodies. To understand the relationship between those interred together, the scientists measured the skeletons' ratios of certain types of nitrogen and carbon atoms that depend on diet. 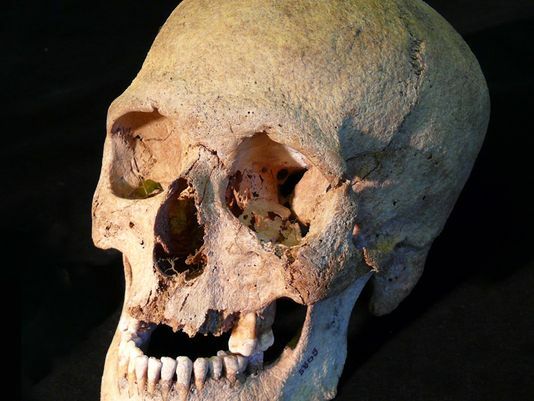 The analysis can't pinpoint the foods eaten by the dead, but the data did show that the people buried with their heads had eaten lots of land-based protein, such as milk or beef. The decapitated people, however, had diets rich in seafood, as did a dog buried at the site. The differences in diet point to a significant gap in social status between those buried with and without their heads, Naumann says. Perhaps those who dined on meat or dairy products were rich or powerful; perhaps they were a religious elite. A DNA analysis showed that most of those buried in graves together probably weren't close kin, at least through their mothers, the researchers say. The mistreatment of the bodies, the DNA results and the dietary differences led the scientists to think that the headless bodies are most likely slaves who met premature ends to be interred with their masters. The paper is an interesting combination of archaeology and molecular studies, says Jette Arneborg of the National Museum of Denmark, and it raises new questions about social structure in the region. But Arneborg says via e-mail that diet "does not give an unequivocal answer on social status." Naumann concedes that the chemical analysis can't detect all dietary differences, but she says those buried together certainly ate differently, indicating clear differences in their community standing — differences that made the Viking world very different from today's egalitarian Scandinavia. "It must've been a rough society," Naumann says. "I often think I'm grateful that I didn't live in that time myself."